Krugman can’t believe people who worry about the national debt are taken seriously. There are no serious budgetary or financing problems on the horizon, so if there’s anything to be concerned about at all, that concern is surely misplaced today. Instead, we should be worried about climate change! Krugman has things exactly backwards, as usual. TONY JONES: When you say the not-too-distant future, what does that mean? PROFESSOR PAUL KRUGMAN: What I envision is that at some point, we have about 10 years now until the baby boomers hit the United States. The US even more than other advanced countries has a welfare state that’s primarily a welfare state for retirees. We have the huge bulge in the population that starts to collect benefits and earn the next decade. Big government is owned by the wealthy and paid for by the middle class and poor one way or another. The tax code is manipulated by the wealthy; cost to comply is paid by consumers through higher prices. It increases lobbyists, corrupts politicians and increases difficulty of entry for competition, which causes less employment opportunities for workers and higher prices. Excessive regulation increases cost for consumers, decreases job opportunities, corrupts politicians, increases lobbyists and increases difficulty of entry for competition. National debt: $154,000 cost per household paid by the consumer not the rich, through higher prices or lower standard of living. Federal Reserve: low interest loans for wealthy and connected, by the time it reaches lower rungs, rates higher, prices higher, including CEO pay – increasing the inequality gap. We have more socialism now than the liberal left’s golden age of the 1950s. We have the FHA, HUD, Freddie Mac and Fannie Mae, Community Reinvestment Act, Social Security, Medicare, Student Loan Programs, Obamacare/ACA, Snap Program, Earned Income Tax Credit, Unemployment Insurance Program and more. So the theory is false and the opposite is true. Socialism hurts the middle class. Big government equals more income inequality, smaller government equals less income inequality. The national debt keeps increasing because of deals, aka compromises, between Democrats (social programs and entitlements) and Republicans (corporate welfare and defense). The middle class pays the heaviest burden for the debt; as it goes up, it further increases the inequality gap by lowering their standard of living. National Debt: $19 trillion costs or is financed by each household, who is ultimately responsible for that debt. This comes out to $154,000 per household if paid for in one lump sum. Financed for 15 years at 5% interest it would take a monthly payment of $1218. Do not be fooled each household pays this one way or another, not the rich; whether you pay it directly in taxes and fees, higher prices or by a lower standard of living than you would otherwise have if the government had not spent that money. That is on top of around $26,000 per household for the yearly federal spending. Which is a another $2166 per month. Total $3400 per month per household. The question is: Is your household getting its money’s worth? Politicians promise you a fantasy land, that they can make your life golden by decree, raise your pay, give you free education, free health care, paid retirement, cheap housing, easy credit and protect you from the evils of the greedy businessman. In reality they can do nothing of the sort. To give you anything they have to take something from you, do not be fooled when they say they will take it from the rich, the rich get it from you (increased prices), in the end it always comes from you. Politicians point at the rich guy as they pick your pocket. They are selling you an illusion that does more harm than good, because in the process they disrupt the free flow and balance of the market causing unintended consequences. Politicians that promise to fix your life by taxing the greedy rich to cover the cost are really the sleaziest of middlemen that are selling you pixie dust while they take their cut, which is power. 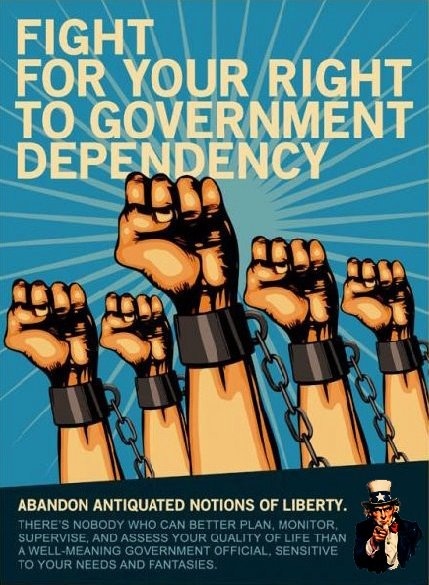 It would seem that American natives are having to accept government dependency over personal sovereignty, because of more developing world immigrants voting democratic/progressive rather than free market. While I don’t consider the arguments presented in The Truth About America’s Survival | Demographics and the 2016 Election to be absolutely convincing, I do find them compelling and important to acknowledge. At what point does the iceberg capsize? Man-caused climate change is balderdash. Happy days are here again? Sure, why not! Spend, spend, spend our way to prosperity! 1. Kudos to Tom for bringing up the CBO analysis and what David Stockman refers to as “Rosy Scenario” on which it is based. Given the discrepancy between the CBPP projection and the CBO projection, and given Rosy Scenario underlying the CBO projection, those guys at CBPP must be smoking some very good stuff. 2. Surprised you didn’t comment on the effect of interest rates normalizing on future debt levels. I am sure that an assumption of perpetually low interest rates must be one of the drivers behind the CBPP revised projections (as Krugman states). Relax this one assumption, and the numbers get very scary, very quickly. These perpetually low interest rates are almost certainly logically incompatible with the growth assumptions contained in the CBPP analysis. Also, if interest rates stay low for as long as something like the CBPP probably assumes, then good luck meeting all the private and public pension plan commitments we have made. With the very low investment returns that perpetually low interest rates would imply, we would have massive pension deficits that could only be made up through large increases in corporate contributions (cutting profits, investments, hiring, growth, etc), large tax increases, and/or defaults (which would often trigger government pension guarantees). I was under the impression that the notes bought by Social Security were actually bought off-budget so that the real national debt was 25% higher than the CBO states? There is no chance that wind and solar will be as practical as fossil fuel for at least a century. Great site guys. Keep up the great work! We need more people educating the country. I believe that Krugman’s prize was essentially sponsored by the state. Just as Rothbard describes in “Anatomy of the State,” the state hires or indirectly supports those who support it’s cause. In the end, Krugman is not an economist. He is a social engineer and statist. He is absolutely, 100% clueless.